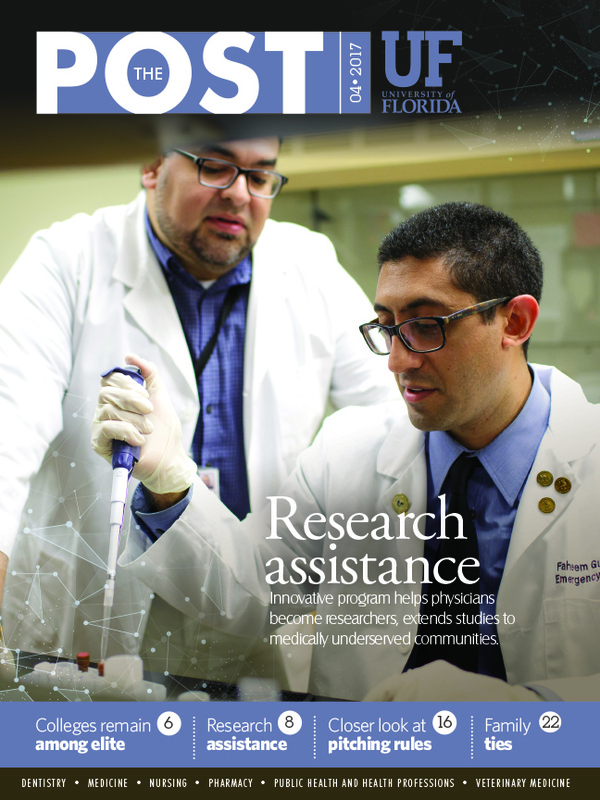 UF Health physicians Andre and Lisa Spiguel juggle their medical careers with a busy family life. Andre and Lisa Spiguel met in a physical chemistry class at the University of Michigan in 1998, and, as corny as it sounds, the chemistry was there. Andre had already graduated with a bachelor’s degree and after doing administrative work at the University of Michigan child and adolescent psychiatry department, he decided he wanted to go back to school to become a physician. Lisa was an undergraduate junior on the medical track. On their one-year anniversary of dating, Andre proposed to Lisa. Today, the Spiguels are both UF Health surgeons who recently celebrated their 15th wedding anniversary. Andre Spiguel, M.D, is an associate professor in the department of orthopaedics and rehabilitation in the oncology and trauma divisions at the UF College of Medicine. Lisa Spiguel, M.D., is an assistant professor in the UF College of Medicine’s division of general surgery’s surgical oncology service. Her focus is on the surgical care of breast cancer and overall breast health. Although they now work at the same place, things were not always so convenient. After graduating from the University of Michigan, Lisa, now 38, went on to earn her medical degree from Wayne State University. She then completed her general surgery residency at the University of Chicago and the Lynn Sage Breast Surgery Fellowship at Northwestern Memorial Hospital. Having lived in Chicago for eight years and nearing the end of their medical training, the couple began seeking work opportunities. Describing orthopedic oncology as “highly subspecialized” but knowing the University of Florida was “really where it all started,” Andre said he always had his eye on UF Health. That opportunity came when UF Health offered Andre an interview for a position. He and Lisa came to Gainesville together for the interview only to find out that UF Health was soon to be in need of a breast surgeon as well, and the rest is history. While Andre finished his second fellowship in orthopaedictrauma at Washington University in St. Louis, Lisa moved to Gainesville with the couple’s children to take the breast surgical oncology position. Her mother helped take care of the kids while she worked, and Andre came to visit every other weekend before moving to Gainesville in 2013 to join his family and begin working at UF Health. Balancing work and family life, as their three children are now 8, 4 and 1 years old, can get hectic. But with the support of family and loved ones nearby, the couple said they have been able to excel. “Our time together is ‘after hours,’ either late at night or at 5 in the morning getting ready to go to work because when we’re at home, we’re all about our kids,” Andre said. Nevertheless, they do manage to drop in and see each other briefly during their workdays. Though their schedules are busy, the Spiguels said the passion they have for their jobs is what keeps them motivated. Luckily, with love of their families and each other also comes love of their careers.